MindManager is a great program but it has its shortcomings; this is the second in an occasional series of articles on how to overcome some of these. Many of these posts are based on solutions I’ve suggested in response to questions on the Mindjet community forum. In part 1 I described how to select topics by level, while in this post I’m looking at how to set up and use “secret” markers. 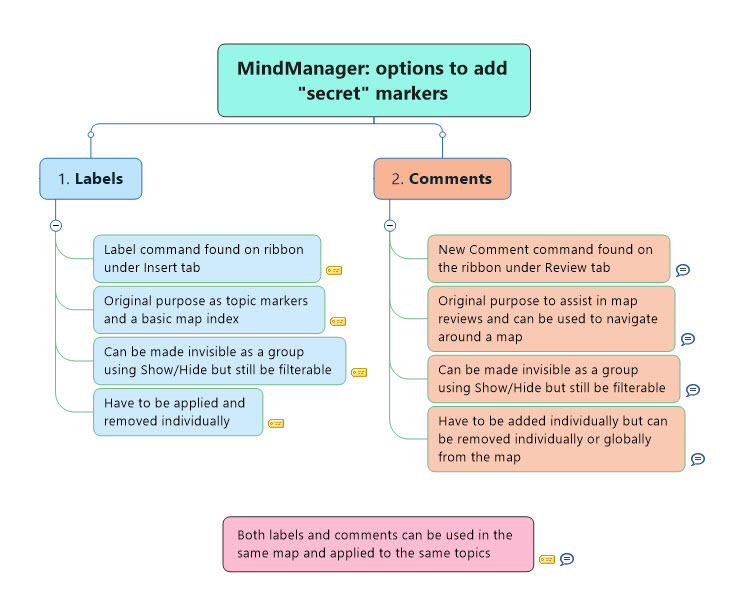 MindManager has a wealth of features including a comprehensive set of icons, flags and markers which can be added to topics. It also provides a facility to hide these icons altogether while still making them available as filterable objects. This is handy if you want to reduce visual clutter in a map, for example when you want to print it. However, it is an all-or-nothing feature which can’t be applied just to selected icons; they are either all visible or invisible (the same limitation also applies to text tags). This means that there is no opportunity to set up specific individual markers, or groups of markers, which can be hidden while others remain on show. There are lots of ways in which a facility to set up selected “secret” markers would be useful. You might want to distinguish otherwise-unrelated special tasks that you want to keep an eye on without making this obvious, or your map may have topics which share a specific feature that needs to be recognised but which can be ignored most of the time. Secret markers can also be helpful as a way of marking topics in very large maps that you need to find quickly without adding to the map’s overall clutter. Labels: Labels are an “evolutionary relic” in MM, largely made redundant by the versatility of markers and tags. However they do still exist, hanging on precariously at the end of the ribbon under the Insert tab, unloved and it would seem largely neglected by the MM Help file. They do however offer some useful features; they are unlikely to be employed for any other purpose by most users, they provide a symbol which can be shown or hidden independently of MM’s standard topic markers and, like icons, they can be filtered. To apply Labels, select the topic you want to label, then click on the Label button. A dialogue box will appear asking for a name, with the default being the name of the topic; unless you have a specific reason to do otherwise you can stick with this (label names provide a form of index – they are unique and can be clicked on in the Label dialogue box to go to the associated topic). Click on Add to apply the label to the topic – you will then need to click the Close button to dismiss the dialogue box. The label should then appear next to the topic. Labels can be shown or hidden by toggling the tick next to Labels on the dialogue box that appears when you click the Show/Hide button on the View tab on the ribbon. Regardless of whether they are visible or not, they can also be selected by using the Text and Other Elements tab on the Power Filter and ticking the Labels box in the Power Filter dialogue box. There are a couple of downsides to using Labels. It takes at least three clicks to apply each label and they have to be applied and removed from to topics individually. Comments: These work in a similar way to Labels and are easier to apply, but this means they are more likely to be used for their intended purpose as a facility for multiple users to add comments when the map is reviewed. If however you don’t need this facility Comments offer a few other advantages over Labels. To apply Comments, select the topic, then click on the New Comment button under the Review tab. The Topic Comments box will appear with the user name and date. You can add a comment if you wish but you don’t need to do so. The Comment symbol should now appear next to the topic. You can then click the Close button on the Topic Comments box, but if you are leaving the Comment blank you don’t need to close it if you are going to immediately add other Comments. Just repeat the process for other topics as required and close the box only when you are finished. Like Labels, Comments can be shown or hidden by toggling the tick next to Comments on the Show/Hide dialogue box – and as with Labels they can be selected in the Power Filter whether they are visible or not. In the case of Comments this is done by selecting the Review Info tab and ticking the “Topic Comments Authors” box in the Power Filter dialogue box. You can move around the map between topics with comments in a clockwise or counter-clockwise direction using the Next or Previous commands on the Review tab. If you have added text to your comments this can be searched for. You can remove Comments globally as well as individually from the map using the Remove command on the Review tab. One more thing. It is of course possible to use both Labels and Comments as secret markers in the same map and even on the same topics, but don’t forget to check the Power Filter settings to see that the appropriate filters are selected or deselected to get the results you want when you filter the map. Next up: how to set up complex filters using conditional formatting.